Dogs in the Vineyard is an indie RPG created by Vincent Baker; it has an unusual set of dice mechanics for its conflict resolution, and as part of that it encourages players to take turns shaping the game’s narrative. While it certainly isn’t everyone’s cup of tea, I have had a lot of fun with it. It’s also highly moddable, much like other Vincent Baker games (Apocalypse World being a prime example). While the DitV sourcebook describes a Wild West setting full of civil and religious strife, I’ve heard or seen others using the system to play in mafia-based story lines, Star Wars settings, feudal Japan, or even The Matrix. And Baker hacked his own system to tell horror stories, in Afraid in the Vineyard. So of course someone decided to modify things a little further to turn it into a storytelling system that would allow you to play in a classic zombie movie. Sadly, while they’ve playtested their zombie hack, the ruleset that I was able to find online is nowhere near final. I’m going to cobble something together from those notes as best as I can, and when I’ve done that I’ll share the result with you. If you’re already familiar with DitV and Afraid, maybe you’ll enjoy taking a look too? 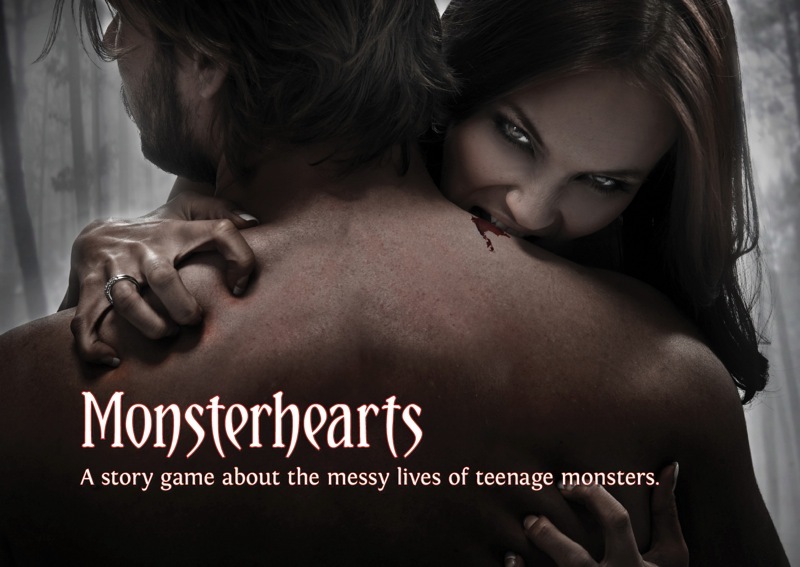 Monsterhearts sells itself as “the messy lives of teenage monsters.” But the truth is that the monstrous nature of the PCs in any game of Monsterhearts really just serves as a reminder of the alienation, discomfort, and feeling of mislabeled or misunderstood powerlessness that gnawed at so many of us when we were teenagers. And maybe as adults as well. Furthermore, themes which have filled classic literature for ages rear their heads again and again in this game; you don’t have to have ever experienced any of them yourself in order to be fascinated by and indulge yourself in them. A quick background: this is an RPG which has grown out of the Apocalypse World system created by Vincent Baker. It takes the sparse elegance of Baker’s ruleset and applies it to a very different type of life. Read on to find out what makes Monsterhearts different from Apocalypse World, and learn some of what makes it so dynamic and so much fun to play.